The Raspbery Pi was an overnight success with schools, the DIY community, and other enthusiasts, when it launched in 2012, and now its replacement should prove just as popular. The Raspberry Pi Foundation is launching the Raspbery Pi 2 today. This model is still the size of a box of cards and will still cost $35, only now it's a lot more powerful - and Microsoft has already promised to support it with a version of Windows 10. The Raspbery Pi 2 features a Broadcom BCM2836 quad-core chip with 1GB RAM, multiple USB ports, HDMI and audio ports, a microSD card slot, headers for a camera and screen, and input/output pins where you can add sensors or a daughter board with additional hardware features. Its 900MHz CPU is fully capable of running the full gamut of Linux distros as well as Android and, to no surprise, Windows 10. Microsoft said today that they were joining the Raspbery Pi Foundation, and were developing a version of Windows 10 for the pocketable computer. Only the Raspberry Pi 2 will be getting Windows 10, and not the older models, which makes sense. I don't know that the single core CPU in the previous generation Rasperry Pis would be up to the task. Windows 10 is going to be available as a free download later this year. And thanks to the powerful graphics chip, it's going to be more than capable of running HD video. The BCM2836 CPU has the same Broadcom VideoCore IV graphics core as the single-core BCM2835 CPU in the original Raspberry Pi, which means it should be equally good at supporting 3D graphics while running your apps at a considerably faster clip. 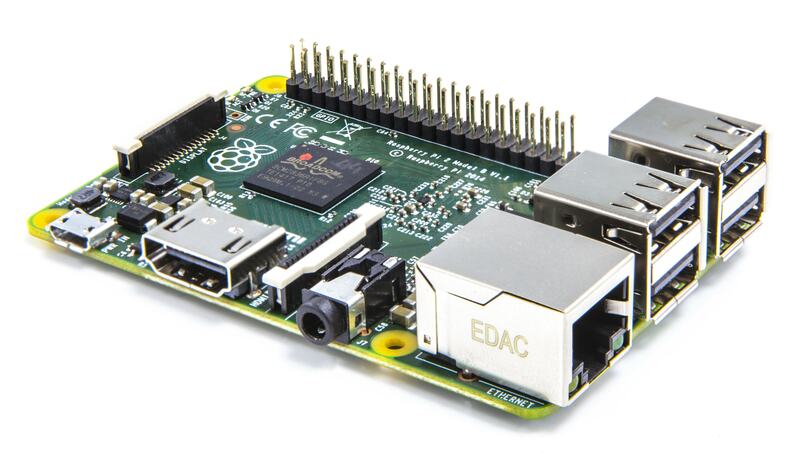 The new Raspberry Pi 2 is going to be sold alongside the existing models, which will stay in production. While the Raspberry Pi hadn't been intended for the industrial market, the Foundation said that they have a lot of industrial customers who want to keep producing equipment based on the original Raspberry Pi for the time being. For that reason the Raspberry Pi Model B and Model B+ will stay in production for as long as there’s demand for it. All three boards will sell for $35, and the Raspberry Pi Model A+ will also be available as the $20 entry-level Raspberry Pi variant. The Raspberry Pi has been used in many a science project and DIY project, and probably my favorite project would be the ones which combined a Raspberry Pi with an E-ink ereader like the Kindle. There is a clone called Banana and it has had a model (Pi BPi M1) faster than the current Rabsbery Pi for quite a long time. For the same price. They are preparing a quad core version BPi M2. The same price? I thought the Bananapi cost a lot more ($55-ish). Got a link? I’d be happy to write about a better alternative. Apparently the version of Windows it will run is Win10 ATHENS. Which sounds like it will be a nice fit for ebook readers: dirt cheap, small footprint, run universal apps. Maybe somebody will finally make a serious play for the corporate ebook market. An ereader front end to SharePoint will move if the price isn’t outrageous. I may be wrong, but it sounds like this “Athens” is a new version of Windows RT. It’s not going to be x86 compatible. Win10 is to be ARM compatible. It’s going on to smartphones, some of which have a weaker CPU than the RPi. Unless I’m mistaken, Win 10 Standard runs on x86 processors and will run legacy programs. The ARM versions will only run “Universal” apps, which I guess is the new name for Metro/Modern. Just like RT. That is a nuance I had missed. I need to look into it. Thanks. I’d sitck with the pi and the proven bootloader.